"Kidney beans, baked beans and butter beans are combined with ground beef, bacon and onion and baked. It's thick, hearty, and pretty tasty too! This can also be done in a slow cooker." In a large skillet over medium heat, fry the ground beef, bacon and onion together until ground beef is no longer pink. Drain fat. 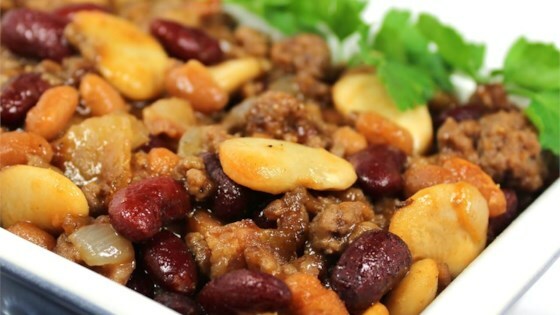 In a large mixing bowl, combine the kidney beans, baked beans with pork and butter beans. Stir in the ketchup, white vinegar, dry mustard, brown sugar and cook beef mixture. Mix thoroughly, adding salt and pepper to taste. Pour the bean and meat mixture into a 9x13 inch baking dish. Bake in preheated oven for 30 to 40 minutes. See how to make a delicious bean and beef side dish. This is a great recipe.... can also be made in a crock pot (cook approx 4-6 hours on high) instead of being baked. Provides a great aroma through-out the house all day!